1also .eu, shared with other European Union member states. Estonia (older Esthonia), officially the Republic of Estonia ( Estonian: Eesti or Eesti Vabariik), is a country in Northern Europe. Estonia has land borders to the south with fellow Baltic state Latvia (339 km) and Russia (229 km) to the east. It is separated from Finland in the north by the narrow Gulf of Finland and from Sweden in the west by the Baltic Sea. Estonia has been a member of the European Union since May 1, 2004 and of the NATO since March 29, 2004. Human settlement in Estonia became possible 11,000–13,000 years ago, when the ice from the last glacial era melted away. The oldest known settlement in Estonia is the Pulli settlement, which was located on the banks of the river Pärnu, near the town of Sindi, in southern Estonia. According to radiocarbon dating, it was settled around 11,000 years ago, at the beginning of the 9th millennium BC. The end of the Bronze Age and the early Iron Age were marked by great cultural changes. The most significant was the transition to farming, which has remained at the core of Estonian economy and culture. From approximately the 1st to 5th centuries AD, resident farming was widely established, the population grew, and settlement expanded. Cultural influences from the Roman Empire reached Estonia, and this era is therefore also known as the Roman Iron Age. A more troubled and war-ridden middle Iron Age followed with external dangers coming both from the Baltic tribes, who attacked across the southern land border, and from overseas. Several Scandinavian sagas refer to campaigns against Estonia. Estonian pirates conducted similar raids in the Viking age and sacked and burned the Scandinavian capital of Sigtuna in 1187. By the early 13th century, Estonia was divided into eight large counties — Saaremaa, Läänemaa, Rävala, Harju, Viru, Järva, Sakala, and Ugandi. Annual consultations were held by representatives of several counties and developments took the direction of establishing a state. Estonia until this time retained a pagan religion centered around a deity called Tharapita. Estonia was christianised when the German " Livonian Brothers of the Sword" invaded southern Estonia as part of the Northern Crusades in the early 13th century. At the same time, Denmark attempted to take possession of northern Estonia. Estonia was consolidated under the two forces by 1227. Northern Estonia remained a possession of Denmark until 1346. Tallinn (known as Reval at the time) was given its Lübeck Rights in 1248 and joined the Hanseatic League at the end of the 13th century. In 1343, the people of northern Estonia and Saaremaa rebelled against the rule of the Germans in the St. George's Night Uprising, which was put down by 1344. There were unsuccessful Russian invasions in 1481 and 1558. After 1524, during the Protestant Reformation, Estonia converted to Lutheranism. During the Livonian War in 1561, northern Estonia submitted to Swedish control, while southern Estonia briefly came under the control of Poland in the 1580s. In 1625, mainland Estonia came entirely under Swedish rule. Estonia was administratively divided between the provinces of Estonia in the north and Livonia in southern Estonia and northern Latvia, a division which persisted until the early 20th century. In 1631, the Swedish king Gustavus Adolphus forced the nobility to grant the peasantry greater rights, although serfdom was retained. In 1632 a printing press and university were established in the city of Tartu (known as Dorpat at the time). This period is known in Estonian history as the "Good Old Swedish Times." Following the Great Northern War, the Swedish empire lost Estonia to Russia ( 1710 de facto, and 1721 de jure, by the Treaty of Nystad). However, the upper classes and the higher middle class remained primarily Baltic German. The war devastated the population of Estonia, but it recovered quickly. Although the rights of peasants were initially weakened, serfdom was abolished in 1816 in the province of Estonia and in 1818 in Livonia. As a result of the abolition of serfdom and the availability of education to the natives, an active Estonian nationalist movement started in the 19th century. It began on a cultural level, resulting in the establishment of Estonian language literature, theatre and professional music and the formation of the Estonian national identity. Among the leaders of this movement were Johann Voldemar Jannsen, Jakob Hurt and Carl Robert Jakobson. Significant accomplishments were the publication of the national epic, Kalevipoeg, in 1862, and the organization of the first national song festival in 1869. In response to a period of Russification initiated by the Russian empire in the 1890s, Estonian nationalism took on more political tones, with intellectuals first calling for greater autonomy, and later, complete independence from the Russian empire. Following the October Revolution, Estonia declared itself an independent republic on February 24, 1918. After winning the Estonian Liberation War against Soviet Russia (the Treaty of Tartu was signed in February 2, 1920), Estonia maintained its independence for twenty-two years. 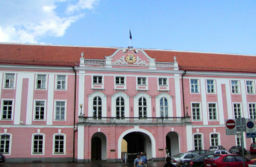 Initially a parliamentary democracy, the parliament ( Riigikogu) was disbanded in 1934, following political unrest caused by the global economic crisis. Subsequently the country was ruled by decree by Konstantin Päts, who became President in 1938, the year parliamentary elections resumed. Estonia was occupied by Soviet troops in June 1940, as a consequence of the secret amendment to the August 1939 Molotov-Ribbentrop Pact between Nazi Germany and the Soviet Union. Estonia was formally annexed into the Soviet Union in August 1940 as the Estonian SSR. Many of the country's political and intellectual leaders were killed or deported to remote areas of Russia and other parts of the USSR by the Soviet authorities during 1940 to 1941. The repressions also included thousands of ordinary people. When German operation Barbarossa started against the Soviet Union thousands of young men were also forcibly drafted into the Red Army. Hundreds of political prisoners whom the retreating Soviets had no time to move, were massacred. The country was occupied by the Third Reich from 1941 to 1944, when Soviet forces reconquered it after fierce battles in the northeast of the country on the Narva river and on the Tannenberg Line (Sinimäed). Such was the fear and disgust of the general population against the Soviet oppressors that in the face of imminent re-occupation by the Red Army, tens of thousands of people chose to either flee the country to Finland or Sweden or retreat together with the Germans. In 1949, in response to slow progress in forming collective farms (as prescribed by the Soviet ideology), tens of thousands of people were forcibly deported in a few days either to labor camps or Siberia where half of them perished and the other half was not allowed to return until early 1960s (several years after Stalin's death). That and previous repressions in 1940-1941 sparked a guerilla war against the Soviet authorities in Estonia which was waged into the early 1950s by the so called " forest brothers" (metsavennad) consisting mostly of Estonian veterans of both the German and Finnish armies as well as some civilians. The Soviet era in Estonia which lasted from 1944 to 1991 was in general detrimental to the country as a whole. In addition to the usual Soviet-style forced collectivization of the agriculture, Estonia was also forced to go through with industrialization which was inefficient, and sometimes very destructive environmentally. Militarization was another aspect of the Soviet regime. Estonia was located very close to capitalist countries (Sweden, Finland) and therefore was heavily militarized. Large part of the country (5-10%) and especially the coastal areas were restricted to anyone but the Soviet military. Most of the northern, northwestern and western sea shore and all of the islands (including Saaremaa and Hiiumaa) were declared as "border zones" and Estonian population not directly living there was restricted from travelling there without permit and could be punished if they did so. Travelling in Estonia today it is not very difficult to find an abandoned former Soviet military installation in coastal regions. Even several former large airfields (notably the former strategic bomber/fighter bases in Tartu and Haapsalu) are abandoned today. Probably most notable of all closed military installations was the city of Paldiski which was in its entirety closed to all public access. The reason for it was simple - the city had a support base for the Soviet Navy's submarines, and several large military bases including a nuclear submarine training centre complete with a full-scale model of a nuclear submarine with working nuclear reactors. The reactor is decommissioned today and its fuel was removed by a special task force as the Soviet troops left, but the conserved radioactive reactors are there under state supervision to this day. The reactor building was passed into Estonian control a year later than the Soviet troops left Estonia in 1994. Russification was another effect brought by the Soviet occupation. Hundreds of thousands of Russian-speaking migrants (mostly from Russian Federation or Ukraine) were relocated to Estonia by the Soviet administration and Communist Party to conduct the aforementioned industrialization and militarization. The immigrants stayed on to form part of the population. By 1980, when part of the Moscow Olympic Games were also held in Tallinn (The Olympic Regatta part), the Russification (and the state-orchestrated immigration) had achieved already such a level, that it started sparking popular protests. The official language which had been both Estonian and Russian started to be increasingly Russian. The tides turned as the Soviet Union ran into major economic difficulties as a consequence of the Cold War and begun to break up. The economic difficulties of the end of the 1980s were often very anecdotal and embarrassing to the Soviet system - even common household goods like light bulbs, toilet paper and soap were often difficult to purchase and required 'connections'. Also food was beginning to be rationed. As the Soviet currency (the rouble) lost its value, these and other 'deficit' goods were often barter-traded or sold in foreign currency on the black market. As the situation developed, in Estonia a movement for more self-governance started. In the beginning, at the period of 1987-1989 it was partially for more economic independence but as the Soviet Union weakened and it became increasingly obvious that nothing short of full independence would do, and the country began a course towards self-determination. In 1989 a major landmark demonstration was held for more independence, called The Baltic Way. During the demonstration a human chain consisting of more than two million people was formed through all of the three Baltic states - Estonia, Latvia and Lithuania (the latter two former Baltic and then Soviet states had and continue to have similar fates and aspirations as Estonia). Estonia regained its independence on August 20, 1991, with the Singing Revolution during the Soviet military coup attempt in Russia and the following collapse of the Soviet Union. The first country to diplomatically recognize Estonia's reclaimed independence was Iceland closely followed by Denmark. The last Russian troops left on August 31, 1994, and Estonia joined NATO on March 29, 2004 and the European Union on May 1, 2004. Estonia is a constitutional democracy, with a president elected by its unicameral parliament (elections are held every four years). The government or the executive branch is formed by the prime minister, nominated by the president, and a total of 14 ministers. The government is appointed by the president after approval by the parliament. The legislative power lies with the unicameral parliament, the Riigikogu or State Assembly, which consists of 101 seats. Members are elected by popular vote to serve four-year terms. The supreme judicial power is vested in the Supreme Court or Riigikohus, with 19 justices. The Chief Justice is appointed by the parliament for nine years on nomination by the president. Internet voting has been used in local elections in Estonia. The lawmakers in Estonia have authorized Internet voting for parliamentary elections as well. . On November 27, 2006, U.S. President George W. Bush made an informal overnight stop in Tallinn as he journeyed to a NATO summit conference in Riga, Latvia. Estonia lies on the eastern shores of the Baltic Sea immediately across the Gulf of Finland from Finland on the level northwestern part of the rising east European platform between 57.3° and 59.5° N and 21.5° and 28.1° E. Average elevation reaches only 50 metres, and the country's highest point is the Suur Munamägi in the southeast at 318 metres. Oil shale (or kukersite) and limestone deposits, along with forests which cover 47% of the land, play key economic roles in this generally resource-poor country. Estonia boasts over 1,400 lakes. Most are very small, with the largest, Lake Peipus, (Peipsi in Estonian) being 3555 km². There are many rivers in the country. The largest are the Võhandu (162 km), Pärnu (144 km), and Põltsamaa (135 km). 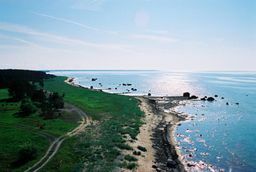 Estonia also boasts numerous bogs, and 3794 kilometers of coastline marked by numerous bays, straits, and inlets. The number of islands and islets is estimated at some 1,500. Two are large enough to constitute their own counties: Saaremaa and Hiiumaa..
Estonia lies in the northern part of the temperate climate zone and in the transition zone between maritime and continental climate. Because Estonia (and entire Northern Europe) is continuously warmed by the Gulf Stream it has a milder climate despite its northern latitude. 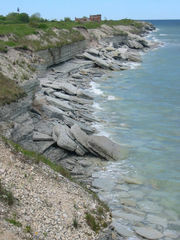 The Baltic Sea causes differences between the climate of coastal and inland areas. The average annual temperature in Estonia is 4.5 degrees Celsius. The average temperature in February, the coldest month of the year, is negative 5.2 degrees Celsius. The average temperature in July, which is considered the warmest month of the year, is 17 degrees Celsius. The climate is also influenced by the Atlantic Ocean, the North-Atlantic Stream and the Icelandic Minimum, which is an area known for the formation of cyclones and where the average air pressure is lower than in neighbouring areas. Estonia is located in a humid zone in which the amount of precipitation outnumbers total evaporation. There are about 160 to 180 rainy days a year, and average precipitation is biggest on the western slopes of the Sakala and Haanja Uplands. Snow cover, which is deepest in the south-eastern part of Estonia, usually lasts from mid-December to late March. As a member of the European Union, Estonia is part of the world's largest economic zone. In 1999, Estonia experienced its worst year economically since it regained independence in 1991, largely because of the impact of the August 1998 Russian financial crisis. Estonia joined the WTO in November 1999. It was the second Baltic state to join. With assistance from the European Union, the World Bank and the Nordic Investment Bank, Estonia completed most of its preparations for European Union membership by the end of 2002 and now has one of the strongest economies of the new member states of the European Union, which it joined on 1 May 2004. 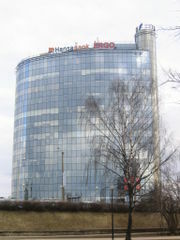 The Estonian economy is growing quickly, partly due to a number of Scandinavian companies relocating their routine operations to the country and Russian oil transit using Estonian ports. Estonia has a strong information technology (IT) sector. Its GDP PPP per capita is at $17,802, the highest of the Baltic states, while its unemployment rate was 4.2% in July 2006, one of the lowest in the European Union. In 1994, Estonia became one of the first countries in the world to adopt a flat tax, with a uniform rate of 26% regardless of personal income. In January 2005 the personal income tax rate was reduced to 24%. A subsequent reduction to 23% followed in January 2006. The income tax rate will be decreased by 1% annually to reach 20% by January 2009. Since January 1, 2000, companies have not had to pay income tax on re-invested income. However, tax is due on profit distributions (including hidden distributions) at a rate of 24%. Despite the fact that only the moment of taxation was shifted from earning profits to their distribution, leaving the rest of the corporate taxation system mostly unchanged, the current legislation is said to be in violation of one of the fundamental freedoms of the European Union — free movement of capital. Estonia is to remove this hindrance by January 2009 when the temporary derogation expires. In June 1992, Estonia replaced the ruble with its own freely convertible currency, the Kroon (EEK). A currency board was created and the new currency was pegged to the German Mark at the rate at 8 EEK for 1 DEM. When Germany introduced the Euro, the peg was changed to 15.6466 Kroon for 1 Euro. The Estonian government is intending to adopt the Euro as the country's currency on 1 January 2008 due to continued high inflation, and finalised the design of Estonia's Euro coins in late 2004. Estonia exports machinery and equipment (33% of all exports annually), wood and paper (15% of all exports annually), textiles (14% of all exports annually), food products (8% of all exports annually), furniture (7% of all exports annually), and metals and chemical products. Estonia also exports 1.562 billion kilowatt hours of electricity annually. Estonia's export partners are Finland (26.4%), Sweden (12.9%), Latvia (8.8%), Russia (6.5%), Germany (6.2%), and Lithuania (4.8%). Estonia imports machinery and equipment (33.5% of all imports annually), chemical products (11.6% of all imports annually), textiles (10.3% of all imports annually), food products (9.4% of all imports annually), and transportation equipment (8.9% of all imports annually). Estonia imports 200 million kilowatt hours of electricity annually. 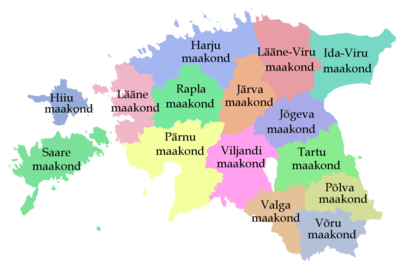 Indigenous Estonian-speaking ethnic Estonians constitute nearly 70 percent of the total population of about 1.3 million people. First and second generation immigrants from various parts of the former Soviet Union (mainly Russia) comprise most of the remaining 30 per cent. 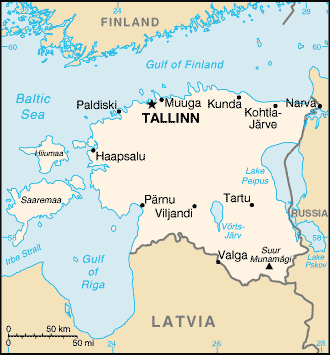 The latter, mostly Russian-speaking ethnic minorities, reside predominantly in the capital city ( Tallinn) and the industrial urban areas in northeastern Estonia (Ida-Virumaa county). There is also a small group of Finnish descent, mainly from Ingermanland (Ingria). 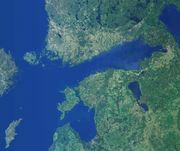 Historically, large parts of Estonia’s north-western coast and islands have been populated by an indigenous ethnically Swedish population called "rannarootslased" ("coastal Swedes"). The majority of Estonia's Swedish population fled to Sweden in 1944, escaping the advancing Soviet Army. Only about a thousand Swedes were left. The country's official language is Estonian, a Finno-Ugric language which is closely related to Finnish. It has been influenced by German, and like Finnish contains many Swedish words. Russian is also widely spoken as a secondary language by 30- to 70-year-old ethnic Estonians, because Russian was taught as a compulsory second language during the Soviet era. Younger estonian people can usually speak English, having learned it as their first foreign language. Most of the russians don't speak estonian. The predominant religion of indigenous ethnic Estonians has traditionally been the Christian belief in the form of the Protestant Evangelical Lutheran confession; however, less than a quarter of ethnic Estonians define themselves as active believers at present. Most believers amongst the Russian minority are Eastern Orthodox. The Ecumenical Patriarchate of Constantinople has since the 1920s recognised a separate national Estonian Orthodox Church, which has led to strained relations with the Russian Orthodox Church, which claimed sole authority over Orthodox believers in the country during the period of Soviet rule. There are nearly 10,000 Muslims in Estonia (most of whom are Tatars), as well as a number of smaller Buddhist, Protestant and Jewish groups, and some neopagans who revere the local ancient deity Taara. Q: What religion is the dearest, most cherished for you? Altogether 1,000 people were questioned, of which 72% were Estonians. According to the most recent Eurostat "Eurobarometer" poll, in 2005 , only 16% of Estonian citizens responded that "they believe there is a God", whereas 54% answered that "they believe there is some sort of spirit or life force" and 26% that "they do not believe there is any sort of spirit, God, or life force". This, according to the survey, would make Estonians the least religious people in the 25-member European Union. State of World Liberty Index 2006: 1st out of 159 countries. Human Development Index 2006: Rank 40th out of 177 countries. Reporters Without Borders world-wide press freedom index 2006: Rank 6th out of 168 countries. Index of Economic Freedom 2006: Rank 7th out of 157 countries. Estonian folk dance festival "Tantsupidu"